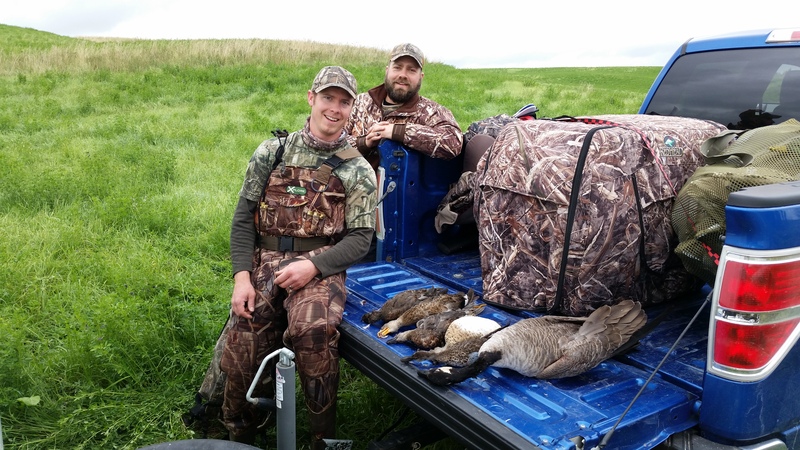 As of September 1st the waterfowl season is open in northern Alberta and Saskatchewan. The southern portion of Alberta opens on the 8th. A group of us decided to get out and try our hand on a DU parcel of land east of Innisfail. For the last 3 years, when we go out for opening day the weather is usually rainy. We had a cold front move into our province and with it a lot of rain. 4 brave souls decided to get out regardless and we met up at 5am and headed out. We were able to get a water spread out and cover the blinds somewhat. 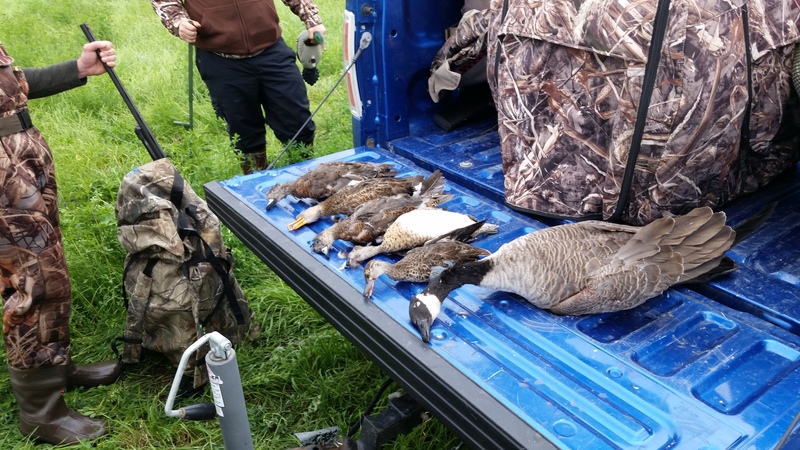 We had some great cover around the pond and after we moved the trucks we waited but not for long, snipes were buzzing us and ducks were hitting us early. I made the first blunder of the season on where we set up our blinds. The ideal spot was on the east side of the pond but the shooting lanes were not clear. We set up on the south side of the pond, we weren’t able to shoot quite a few ducks because of this. Oh well, we did get 6 ducks and 1 Canada. Was a great time and thanks to RJ, Tim, & Lyle for some early season fun, nice to get the misses out of the guns and make sure the gear is ready. The downer for me is that we brought out the new dog Piper and she had fun but didn’t retrieve anything. She went all stubborn and wouldn’t put a duck in her mouth. Oh well, back to the training room, she had her first visit to our backyard’s ‘tree of woe’ for some force fetch training which I thought she didn’t need. She will get it just fine. We will be heading out for opening day for the south region opener. We will be out on Sept 8 in Claresholm working a hailed out pea field lined up by Lyle. I can hardly wait for those birds to be working that field that we have been scouting. Should be fun. Will keep the pictures coming. Now to end this I wanna show you a video summary of our hunt. In clip two it describes my experience with Piper just perfectly.